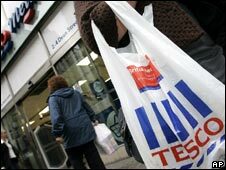 Tesco has reported an 11.8% rise in underlying annual profits for 2007 to £2.846bn, meeting analysts' forecasts. Group sales at the UK's largest retailer rose to £51.8bn, up 11%. Tesco said prices had risen by about 1.5% across the board, but increases in food prices masked price cuts in non-food items. The UK High Street has suffered as households have been squeezed by higher mortgage costs, fuel and food bills. But Tesco remained upbeat. Online and non-food items helped to boost Tesco's UK business, while sales from its international stores also showed strong growth, up 25.3% in 2007. The supermarket group said it would create 30,000 new jobs worldwide this year, with about a third planned in Britain. The results confounded analysts, many of whom had predicted that the wheels had started to wobble on the Tesco juggernaut. Tesco shares rose 7.29%, or 28.50 pence, to 419.50p at close of trade. In the UK, like-for-like sales excluding petrol rose 3.5% during the year to February as Tesco battled a wet summer, a consumer slowdown and "recovering competitors". By the same measure, sales were up 4% in the first five weeks of its new financial year starting 23 February, helped by the early Easter break. "We begin the new financial year confidently - with a good start in the UK, excellent progress in our established international markets and promising early performance from our investments in future growth, particularly in the United States, China and Turkey," said Terry Leahy, Tesco chief executive. Tesco opened 19 new Extra stores, 17 superstores and 103 new Express convenience stores, taking the total number of UK stores to 1,608. It said it was continuing to work with the Competition Commission on the final stages of their investigation into anti-competitive practices in the grocery sector. Richard Hunter, head of UK equities at Hargreaves Lansdown Stockbrokers, called the figures "sparkling", and said the upbeat forecast "set it apart from the crowd". For the first time, Tesco's UK network did not make up the bulk of profit growth, with half coming from its stores overseas. Its expansion drive overseas will continue this year with plans to open 11.5 million square feet of new store space, with 80% of this outside the UK. Analysts had expected a robust performance from Tesco, but had been concerned about the group's performance in the US, particularly after it was revealed last month that its expansion plans for its Fresh & Easy chain had been put temporarily on hold. The outlook for the US economy is grim, with many analysts convinced that it has sunk into a recession. But Tesco said that it was "encouraged" by the performance of the first 60 Fresh & Easy neighbourhood stores, modelled on Tesco Express and located in southern California, Arizona and Nevada. It said sales at these stores were ahead of budget. Another 150 are expected to be open by the end of the year. More details about the performance of Tesco's US business will be available in its half-year report when it will give separate US sales figures for the first time.